This year, the Porta Venezia in Design circuit will officially launch as part of the Fuori Salone during the Salone del Mobile (Milan Furniture Fair). 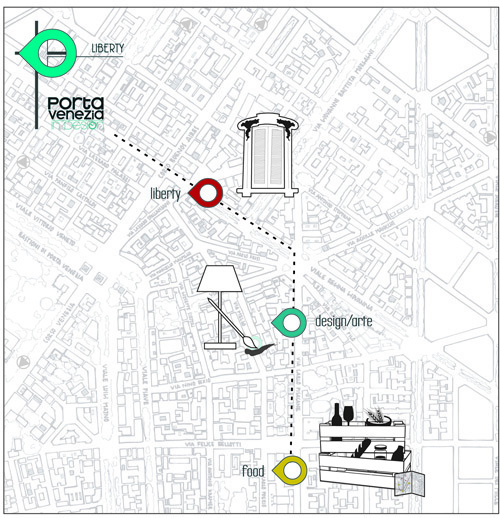 Centered around the Porta Venezia area of Milan, this new circuit that brings art and design with the Italian Liberty style architectural experience in the area. What’s new is the addition of a Food & Wine path that features special menus in select cafés and restaurants in the area. The path is in collaboration with Condotta Slow Food® Milano and the Nutrire Milano project, which brings food products and wines of Lombardia to center stage. It will be interesting to see how this circuit develops, like Ventura Lambrate and Tortona before it.